brochures, business cards, CD/DVDs, flash drives silts are available free of charge. This promotion may be used with other valid promotions (including those found on external websites). Side 1 printed with four-color process and 1 embossed area. Side 2 printed with 1 PMS color using heavy coverage. 90lb White Hopsack stock uncoated. H3 business card slits on right pocket. 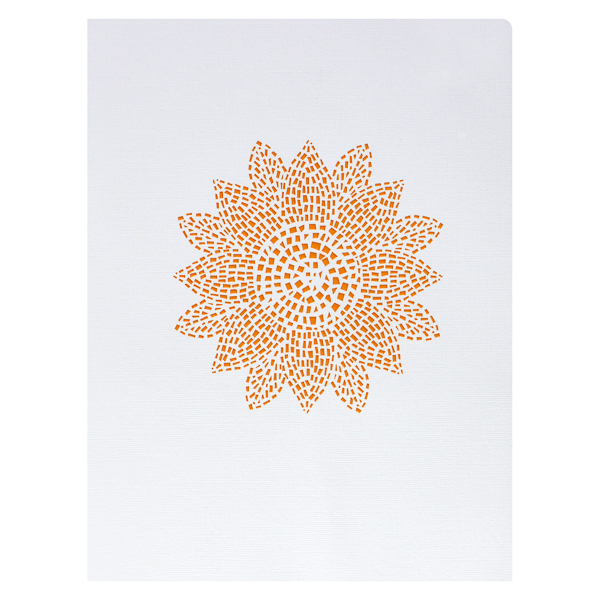 Sunflower Beach enriches its embossed logo with bright orange ink, making it look like both a sunflower and the sun itself. Aquamarine panels and white pockets mimic the resort's pristine beaches in the Texas dune preserves. This minimal design reflects the brand's New Urbanism influences, which include focusing on nature, green living, and connectedness. Four-color process printed on Side 1 of uncoated 100lb White Smooth stock. H3 business card slits on right pocket. Designed for an aviation insurance broker, a blend of cool blue tones and photos create an artistic, yet professional style. 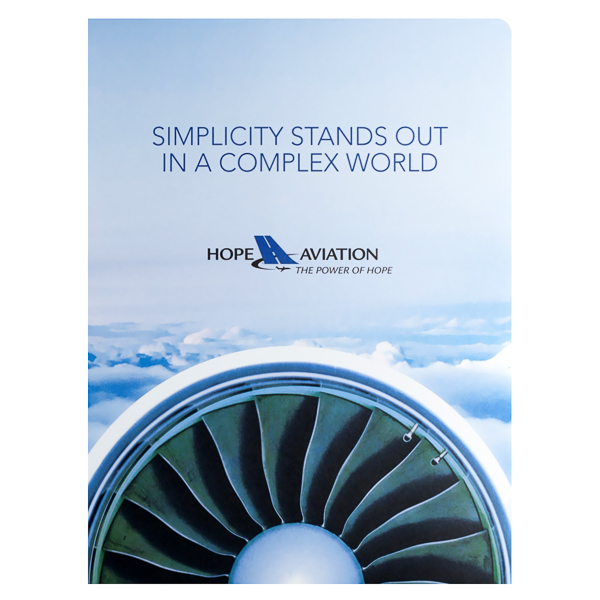 Hope Aviation's slogan and logo hover in the clouds above a jet engine. Dark interior panels feature a photo of an aircraft's control panel, while clouds on the pockets help readers imagine they're piloting a plane. White and blue text match the sky theme and relate important brand information. Four-color process printed on Side 1 of 14pt C2S White Semi-Gloss stock. Coated with Aqueous Matte. Two sets of V4 business card slits on right pocket. 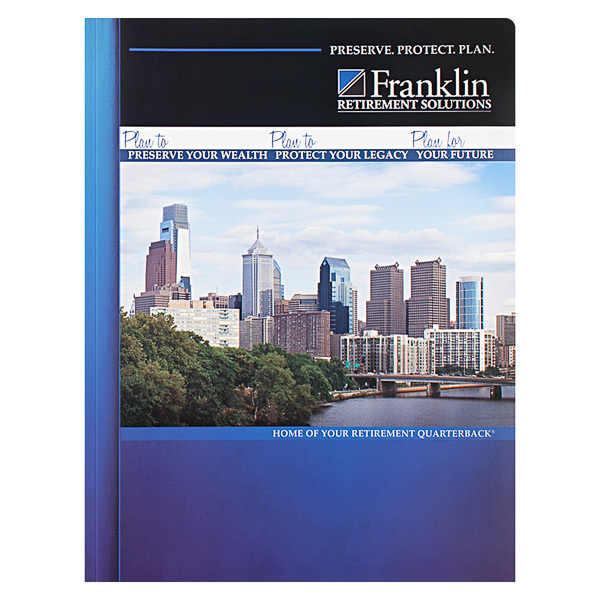 This cover design for Franklin Retirement Solutions packs many ideas into a single space. The logo and slogan at the top of the cover give clients an idea of the firm's role and reinforce its blue color branding. Atop the cover photo (a city symbolizing growth), script text expounds on the slogan's key points. A caption calls the firm a "quarterback," since it protects the client. More photos on back depict Franklin’s hometown, Philadelphia, and point to the contact info at the bottom. Four-color process printed on Side 1 of 12pt C1S White Semi-Gloss stock. Coated with Aqueous Gloss. H3 business card slits on right pocket. Agricultural tech brand AgroFresh chose this great cover photo for its Harvista™ technology. Verdant green leaves around a crisp red apple symbolize the product's power to slow fruit ripening and retain quality post-harvest. 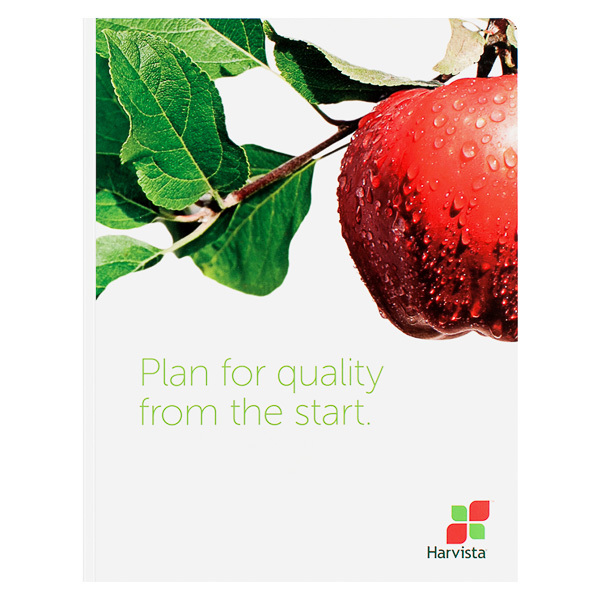 The red and green Harvista™ logo reinforces the photo's message with its leaf shape. A second logo on the back includes contact information to help clients reach AgroFresh. With a quarter inch double-score backbone, this product has more carrying capacity than those with a standard thin spine. Large amounts of 8 1/2" x 11" paper fit securely into the two interior pockets, preventing the damage and dog-earing that occurs when papers stick out of an overstuffed product. This added level of protection means your documents stay crisp, clean, and professional even when presented in large quantities. The backbone is also convenient for carrying small amounts of paper, as its sturdy size provides ample protection for its contents. Dimension Open: 18 1/4" x 12"